In the US, every adult passenger are required to show some kind of identification card or document that the TSA would find acceptable. If you don't have this kind of documentation, you may either be prevented from going into the secure part of the airport terminal, or you may be delayed while security verifies your identification through other means. If you are on a domestic flight in the US, you may not need to use your ID to get a boarding pass or to get on the airplane. Your airline may require you to present a photo ID to board the airplane or at the check in counter, but some airlines don't have this requirement. In most cases, you just need to show a boarding pass to get on the airplane. 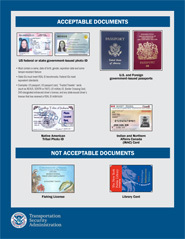 There are two kinds of identification requirements for international travel from the US, identification for getting through TSA security, and identification for the airline. The TSA's ID requirement for entering the secure part of the airport terminal is the same for domestic or international passengers. Airlines require that you show a passport, visa, or some other kind of document to confirm that you are allowed to fly to your destination. Check with your airline to be sure. Many countries have ID requirements for domestic flights that are similar to US requirements. You should check with your airline or with the appropriate authorities within that country to find out what IDs are acceptable for domestic flights. Depending on the country, you may also need additional documents in order to travel by air within that country. International travel (flying from one country to another) typically requires a passport. Depending on the country, you may also require a visa or other documentation in addition to a passport. You should check with both your airline and with the the appropriate authorities in the countries you wish to visit to find out what you may need. For domestic flights within the US, the TSA does not require children (anyone aged 17 or younger) to have any kind of identification to get past security, even for children traveling alone. If a child is traveling alone it may be a good idea to have the child carry some kind of ID, even if it is not a passport or state issued photo ID. For international flights to or from the US, all passengers, including infants, must have a passport. Many common ID cards are not acceptable to the TSA. This would include library cards, fishing licenses, school or university IDs, workplace IDs, or expired IDs that would otherwise be acceptable. Also, a weapons permit is not acceptable, even those that are acceptable forms of ID for voting purposes in some US states. Keep in mind that TSA may be able to use these documents, along with other procedures that they have, in order to confirm your identity and allow you go through security. What if you don't have an acceptable ID? If you don't have an acceptable ID (lost, stolen, etc. ), you should do two things, come early and bring whatever you have. The TSA and the airline can work together to verify your identity and get you through airport security. Do you also always need an ID? State-issued enhanced drivers licenses provide proof of identity and US citizenship, as well as additional information. While the TSA will accept drivers licences from any US state, starting in January 2018, TSA will only consider an enhanced drivers licence as an acceptable form of ID. Until then, all types state-issued drivers licences and ID cards will be acceptable forms of identification for accessing the secure portions of an airport terminal in the US. If you are flying to or from the US, you will still need a passport and other required documentation to complete your journey.